Be sure to pick up my most favorite drink. It's FREE today!! I have ALWAYS loved a slurpee. It is "comfort food" to me. I remember going down to "Mac's" which wasn't exactly a "slurpee" (same thing though) with my 35 cents and getting slurpees in the summer. Learning the delicate balance or riding my bike while still holding the slurpee. Ahhh, those were the days... now the suckers are 99 cents! Still worth every slurp though! here here!! This is on our list of To Dos today. Thanks for the reminder! I would have totally forgotten, and I'm even in Canada to enjoy an amazingly delicious Canadian slurpee! I love them. 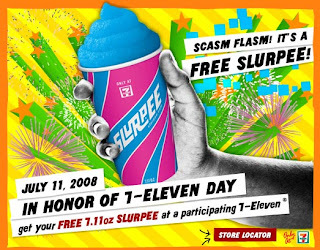 I used to ride my bike all the time to Mac's or Husky or even 7/11 to get slurpees too :) So fun! Oh, CRAP! I can't believe I forgot!! My kids and I were just talking about it the other day, too. Hello!! It's been like 4 days! Where is your memory post? HUMM?? ?